Although changes in the pulmonary vasculature are the primary cause of pulmonary arterial hypertension (PAH), severity of symptoms and survival are strongly associated with right ventricular function, and right heart failure is the main cause of death in patients with PAH. Echocardiography and cardiac magnetic resonance imaging allow noninvasive evaluation of right ventricular function and structure, and a number of indices have been shown to have potential prognostic value in PAH. Given the importance of the right ventricle in PAH, preservation and improvement of its function should be important aspects of therapy; however, there are currently few data specifically related to this aspect of treatment response. Simple, reproducible, noninvasive measures of right ventricular function would help to improve the management of patients with PAH, and to provide tools with which to help establish the optimal therapeutic approach to manage not only the effects of the disease on the pulmonary vasculature, but also to support and improve right ventricular function. Pulmonary arterial hypertension (PAH) is a disease with a range of underlying aetiologies characterised by pathological changes in the pulmonary arteries leading to a progressive increase in pulmonary vascular resistance (PVR) and pulmonary artery pressure (Ppa). Advances in the management of patients with PAH and the availability of disease-specific therapies have resulted in improvements in morbidity and survival in recent years . Nevertheless, PAH remains a devastating disease with progressively debilitating symptoms and high mortality . Right ventricular failure is the main cause of death in patients with PAH, and the ability of the right ventricle to adapt to the progressive increase in PVR associated with changes to the pulmonary vasculature in PAH is the main determinant of a patient's functional capacity and survival . The importance of the right ventricle in PAH has been confirmed in major survival studies, in which a number of haemodynamic factors directly related to right ventricle function have been identified as significant predictors of mortality, including mean Ppa, right atrial pressure, cardiac output and cardiac index [2, 4, 5]. Despite its importance, until relatively recently the right heart has not received the same degree of research interest as other aspects of PAH, and relatively little is known about the mechanisms of right ventricular failure in PAH, the prognostic implications of specific changes in right ventricular structure and function, or the effects of current PAH-specific therapies on the right ventricle [6–8]. The establishment of indicators of right ventricular function and structure, in particular those measured noninvasively, that could be used to assess prognosis and response to therapy would provide useful tools for further research, as well as for patient management. Currently, the most widely used noninvasive techniques are echocardiography (ECHO) and cardiac magnetic resonance imaging (CMRI), and a number of potential indicators assessed using these methods have been proposed. However, many of these indicators remain to be fully validated and standardised in patients with PAH. In terms of treatment, current PAH-specific therapies target pathways known to be involved in the pathogenesis of the pulmonary vascular changes of the disease, but little attention has been given to the effects of treatment on the right ventricle. This article reviews the effects of PAH on the right ventricle, the role of ECHO and CMRI, the prognostic value of noninvasive markers of right ventricular structure and function, and available data on the effects of PAH-specific therapies on the right ventricle. PAH can arise sporadically (idiopathic PAH; IPAH), can be heritable, or can be related to risk factors or associated conditions, such as connective tissue disease, congenital systemic-to-pulmonary shunts, portal hypertension, drugs and toxins, and HIV infection . However, despite heterogeneous underlying aetiologies, all forms of PAH share similar clinical and haemodynamic findings and identical pathological changes in the pulmonary vasculature. These changes are characterised by remodelling of small pulmonary arteries (<500 μm diameter) due to the proliferation of smooth muscle and endothelial cells, leading to hypertrophy of the media and intima, and the formation of plexiform lesions [10, 11]. Although a number of underlying mechanisms for these changes have been proposed, the pathophysiology of PAH is not clearly understood. Whatever the underlying causes, narrowing of the pulmonary vessels, together with the presence of in situ thrombosis and, to a greater or lesser degree, vasoconstriction, leads to restrictions in pulmonary blood flow, and characteristic progressive elevations in PVR and Ppa. Increased afterload is the primary cause of right ventricular adaptation and, ultimately, failure in PAH. The anatomical characteristics of the normal right ventricle (thinner wall and crescent shape) means that it has greater compliance than the left ventricle and is generally able to adapt rapidly to changes in volume load . In the normal heart, a pressure–volume relationship exists in which the right ventricle adapts to an increase in load with an increase in contractility. In patients with PAH, the right ventricle initially copes with the increase in afterload caused by increasing PVR and decreasing pulmonary vascular compliance with initially enhanced systolic contraction; at this stage there is concentric remodelling of the right ventricle, and right atrial pressure remains normal with a steep increase in mean Ppa, and maintenance of cardiac index . Structurally, rising systolic and diastolic ventricular pressures increase diastolic and systolic stretch on the right ventricular wall, which leads initially to an increase in muscle mass (adaptive hypertrophy) due to increased protein synthesis and an increase in cardiomyocyte size through the addition of sarcomeres . However, the right ventricle cannot maintain adaptive hypertrophy in the face of sustained pressure overload, and eventually there is a transition to dilatation. At this stage there is no further increase, or even a decrease, in right ventricular contractility, despite a further increase in load (so called “uncoupling” of the right ventricle). The mechanisms which halt further adaptation of the right ventricle are poorly understood, although there is increasing evidence that an oxygen supply/demand dysbalance for the right ventricle plays an important role in this process , resulting in a complex series of changes in cardiomyocytes and their extracellular matrix . One consequence of right ventricular dilatation is an increase in wall tension, which increases myocardial oxygen demand and simultaneously decreases right ventricular perfusion, leading to further compromised contractility and dilatation. Other factors have also been implicated in the progressive decline of contractility and of right ventricular failure in PAH, including increased chronic sympathetic activation [14, 15], oxidative and nitrosative stress, immune activation and cardiomyocyte apoptosis . An increase in ventricular volume may also lead to functional tricuspid regurgitation, caused by annular valve dilatation and chordal traction, which in turn results in right ventricular volume overload, and thus further progressive annular dilation and right ventricle remodelling . As right ventricular function declines, an increase in right ventricular contraction time and subsequent ventricular asynchrony, together with a decrease in right ventricular stroke volume, leads to underfilling of the left ventricle [17–19]. Filling of the left ventricle is also impaired due to the development of leftwards ventricular septal bowing, resulting from prolonged right ventricular contraction time reducing left ventricle volume during early diastole [18–20]. This, together with systolic/diastolic right ventricular dysfunction, contributes to the marked decline in cardiac output seen in severe PAH. Once right ventricular function has declined, a vicious circle of events is underway which, if not interrupted, subsequently leads to right heart failure. The importance of the progression of right ventricular failure on the outcome of patients with PAH is confirmed by the prognostic impact of measures of right ventricular pump function, such as right atrial pressure, cardiac index and Ppa . In treatment guidelines, cardiac index and right atrial pressure are recommended as important prognostic measures for the evaluation of disease severity and response to treatment . Right heart catheterisation (RHC) is considered the “gold standard” measurement technique for such haemodynamic variables and is accepted as essential for the confirmation of PAH . Although the incidence of complications is low when performed in experienced centres , RHC is associated with a small but real risk of morbidity (e.g. haematoma and pneumothorax) and mortality, which limits its use as a regular follow-up tool to monitor patient status over time or during treatment. This has raised interest in the ability of noninvasive measures to assess patients, to provide prognostic information, and to perform serial measurements to evaluate response to therapy. Of these, the two most widely used techniques are ECHO and CMRI. Although both methods provide variables that correlate with RHC-determined haemodynamic measures linked with prognosis (e.g. Ppa estimation based on ECHO-derived peak velocity of the jet of tricuspid regurgitation; cardiac output based on stroke volume by CMRI), they also offer a range of additional functional and anatomical measures, including those related to the right heart and right ventricular function. ECHO is widely used as part of the initial assessment of patients in whom there is a suspicion of PAH, in the screening of high-risk patients and during follow-up [1, 22]. In total, over 20 different ECHO parameters of right ventricular morphology and function have been identified , although to date only a few have been reported to be associated with prognosis in PAH (table 1). The most reported prognostic association with mortality is the presence of pericardial effusion on ECHO. Pericardial effusion was reported in 54% of patients with severe IPAH, with larger effusion being associated with haemodynamic and echocardiographic evidence of right heart failure, impaired exercise tolerance and poor 1-yr prognosis . In a prospective, multicentre ECHO study of 81 patients with PAH, the presence of a pericardial effusion was the strongest predictor of mortality over the follow-up period of 36.9±15.4 months on multivariate analysis and, together with right atrial area and diastolic eccentricity index (a measure of left septal shift), was also predictive of a composite end-point of death or transplantation (fig. 1) . More recently, data from the large REVEAL registry  and from a cohort study of 276 Chinese patients with PAH also demonstrated that the presence of pericardial effusion was an independent predictor of mortality . The cause of pericardial effusion in PAH is linked to increased right atrial pressure which impairs venous and lymphatic drainage of the myocardium and is, therefore, a reflection of right ventricular (diastolic) dysfunction [25, 26]. Although clearly of value as a prognostic indicator, the degree of pericardial effusion that should be considered to be significant remains to be defined. In general, studies including this parameter give no formal criteria and do not specify factors such as effusion size and the phase at which it should be measured. Kaplan–Meier survival curves for echocardiographic predictors of outcomes. Reproduced from  with permission from the publisher. Along with the presence of pericardial effusion, the tricuspid annular plane systolic excursion (TAPSE) is recommended by treatment guidelines as a prognostic indicator in PAH for the assessment of disease severity and response to therapy, largely because both parameters can be assessed in the majority of patients . TAPSE is a relatively simple measure of the longitudinal movement of the lateral tricuspid annulus towards the right ventricular apex. It is used as a correlate of right ventricular systolic function, as the longitudinal displacement of the right ventricular base accounts for the greater proportion of total right ventricular volume change in comparison with radial shortening in normal ventricles. TAPSE has been shown to have a reasonable correlation with right ventricular ejection fraction (RVEF) [6, 37]. In terms of prognostic value, compared with a TAPSE of ≥1.8 cm, TAPSE of <1.8 cm in patients with PAH was shown to be associated with greater right ventricular systolic dysfunction (lower cardiac index and right ventricular percentage area change) and right heart remodelling (measured by right atrial area index), and decreased survival (94 and 88% versus 60 and 50% at 1 and 2 yrs, respectively; hazard ratio 5.7, 95% CI 1.3–24.9; p=0.02) . However, there are limitations to TAPSE, particularly in patients with significant tricuspid regurgitation , or where left ventricular function, which can also influence TAPSE, is impaired . Parameters of right heart morphology (atrial and ventricular) have also been linked to mortality in studies using ECHO (table 1). Ghio et al. performed an ECHO assessment of 72 patients with IPAH and found that mortality was higher in patients with a right ventricular diameter >36.5 mm than in patients with a right ventricular diameter ≤36.5 mm: 15.9 (95% CI 9.4–26.8) versus 6.6 (95% CI 3.3–13.2) events per 100 person-yrs (p=0.0442). Mortality was similar in patients with right ventricular wall thickness above or below the median value (6.6 mm). However, a right ventricular diameter >36.5 mm in conjunction with a right ventricular wall thickness >6.6 mm was not associated with a poorer prognosis (p=0.6837). These data suggest that a larger right ventricular diameter is a marker of a poor prognosis but a greater right ventricular wall thickness reduces the risk of death associated with a dilated right ventricle , which can be explained by the fact that increased right ventricular wall thickness in case of dilatation protects the ventricle from abnormally high wall tension. The complex anatomy of the right ventricle means that accurate measurement of factors such as size or volume using two-dimensional imaging can be complicated, and also that some measurements that rely on geometric assumptions can be difficult to adopt for the right ventricle by ECHO. The myocardial performance or Tei index (isovolumic contraction time plus isovolumic relaxation time divided by ejection time) represents an estimate of global right ventricular performance which is unaffected by right ventricular geometry . The Tei index increases with increasing right ventricular dysfunction, and has been shown to have prognostic value in a range of conditions, including PAH [31, 32]. Limitations of the Tei index, however, include the fact that it is highly sensitive to the volume status of the patient, and that the parameter is less reliable during tachycardia. Other reported ECHO prognostic parameters include eccentricity index , right ventricular dyssynchrony  and right ventricular systolic to diastolic duration ratio . A comprehensive assessment of prognosis is likely to require the evaluation of a number of different ECHO parameters. A comparative evaluation of the prognostic value of a number of right ventricular function indices in 59 patients with IPAH found that those with TAPSE ≤15 mm and left ventricular eccentricity index ≥1.7 had the highest rate of death or transplantation (51.7 per 100 person-yrs), while patients with TAPSE >15 mm and mild or no tricuspid regurgitation had the lowest event rate (2.6 per 100 person-yrs) . With the development of newer echocardiographic technologies, and methods such as real-time three-dimensional ECHO and speckle-tracking ECHO, there have been a number of studies investigating novel indices of right ventricular dimensions and function in PAH [41, 42]. Their prognostic values require further investigation and validation. Echocardiography is a well-established technique that is widely available, inexpensive and safe, and has proven value in the screening and management of patients with PAH. Nevertheless, it is associated with a number of technical drawbacks and limitations. The technique is operator-dependent, relying on the training and experience of the sonographer. In addition, imaging may be difficult in some clinical situations (e.g. emphysema) and factors associated with the body habitus may affect the acoustic window and thus the ability to visualise and/or measure certain parameters (e.g. tricuspid regurgitation) in some patients. ECHO measurements are highly dependent on factors such as image quality, insonation angle, and load, respiratory phase and probe or patient position during examination, which can introduce inaccuracy and variability, particularly in patients with mild right ventricular abnormalities . In addition, progressive right ventricular dilatation is also accompanied by changes in heart position and orientation which can impact on the interpretation of serial measurements . There is also a lack of standardised models for the calculation of right ventricular volumes and ejection fraction. Addressing these factors is particularly important as ECHO becomes more widely used in routine clinical practice in PAH, outside of more controlled research protocols. Despite these limitations, ECHO is likely to remain an important method for the screening, diagnosis and management of patients with PAH, given its widespread availability. In addition, the development and validation of new techniques and methods may help address many of these current restrictions [43, 44]. Based on current data, CMRI is not a suitable tool for the diagnosis of PAH; however, its ability to provide a more complete overall picture of right ventricular structure and function than RHC and ECHO means that it is proving to be a valuable tool for the assessment of the right ventricle in PAH, particularly its response to therapy [43, 45]. There have been fewer studies evaluating the prognostic value of CMRI parameters in PAH than studies assessing ECHO parameters (table 2). In a study of 64 patients with IPAH followed for 1 yr, right ventricular dilatation and low stroke volume, along with RVEF measured using CMRI were found to be prognostic of mortality (fig. 2) . This study also found that an on-treatment decline in stroke volume was related to treatment failure. Ventricular mass measured by CMRI has been shown to correlate with survival: 1- and 2-yr survival was 91% for patients with a ventricular mass index (VMI; ratio of the right and left ventricular end diastolic mass) <0.7 compared with 65 and 43% in patients with a VMI ≥0.7 , and an elevated right ventricular mass was predictive of poor outcome in a study of 73 patients with PAH . Kaplan–Meier survival curves for baseline cardiac magnetic resonance imaging variables according to the median value in patients with pulmonary hypertension. SVI: stroke volume index; RV: right ventricular; RVEDVI: RV end-diastolic volume index; LVEDVI: left ventricular end-diastolic volume index. Reproduced from  with permission from the publisher. As a technique, CMRI has a number of benefits over ECHO. CMRI provides a higher spatial resolution, and is not limited by factors affecting ECHO (e.g. acoustic window). CMRI allows for the visualisation and measurement of complex three-dimensional geometry and it is therefore particularly suited to the complex morphology of the right ventricle. Precise, noninvasive assessment of cardiac volumes and function is possible, without the need for geometric approximations, while assessments such as flow measurements in the heart and great vessels using techniques such as cine phase-contrast provide more comprehensive data on cardiac function than ECHO [43, 50, 51]. However, in comparison with ECHO, CMRI is expensive and not widely available. Data acquisition and analysis tends to be more intensive and time consuming, and demands significant technical support and expertise. The need for breath holding may be a problem in patients with PAH and claustrophobia when using smaller diameter magnets can be problematic for some, although these problems are decreasing with improving technology. In addition, the use of magnetic resonance imaging is incompatible with ferromagnetic objects such as pacemakers and defibrillators, and infusion pumps, which could also limit its use in some patients [43, 50, 51]. To date, the majority of data regarding the prognostic value of ECHO and CMRI parameters have come from small, single-centre studies; such centres are generally highly experienced and, given the operator dependency of the techniques, it is unclear how appropriate these parameters might be in routine practice. Due to the small size of these studies, multivariate analysis is not possible; therefore, there are limited data on the correlation between these measures and other clinical parameters. There is a need for more multicentre studies to confirm the value of these measures. Current PAH-specific therapies (prostacyclins, endothelin receptor antagonists (ERAs) and phosphodiesterase (PDE)-5 inhibitors) target the pathways involved in the vascular remodelling and abnormal vasoreactivity in the pulmonary vasculature, resulting in a reduction in PVR . In the early stages of PAH, where right ventricular function and cardiac output is relatively well preserved, such a reduction in PVR results in a decrease in mean Ppa consequently resulting in a reduction of right ventricular power output, which is the product of cardiac output and Ppa. However, in patients with severe PAH, a decrease in PVR resulting from medication will be followed by an increase in cardiac output rather than a decrease in Ppa, resulting in an unchanged power output . For this reason, a particular reduction in PVR may have a beneficial effect on the right ventricle in milder forms of PAH, but may not have a beneficial effect on the right ventricle in severe PAH. The latter explains why progressive right ventricular function loss can be found in patients with severe PAH who respond to therapy by a decrease in PVR. Although evidence from patients who have undergone lung transplantation or pulmonary endarterectomy has demonstrated that PAH-induced right ventricle remodelling is reversible [52–54], there are few data on the direct effects of PAH-specific therapies. Such therapies may affect the right ventricle via direct cardiac-specific effects or indirect effects by reducing right ventricular load. In a recent meta-analysis of clinical studies of PAH-specific therapies, active treatment was associated with a reduction in PVR which was accompanied by a decrease in Ppa and an increase in stroke volume, but without an increase in contractility (fig. 3), suggesting that current PAH therapies have predominantly pulmonary vasodilating effects and have limited cardiac-specific effects . Meta-analysis of pulmonary arterial hypertension trials by pump function. ΔSVI: change in indexed stroke volume; ΔP̄pa: change in mean pulmonary arterial pressure; PVR: pulmonary vascular resistance. Reproduced from  with permission. The establishment of suitable ECHO and CMRI parameters to predict outcome and for the serial assessment of response to therapy would be useful management tools; however, to date there are very few randomised, controlled studies of PAH-specific therapies which include the assessment of such parameters as outcome measures (table 3). The most comprehensive assessment published to date is an ECHO substudy of patients included in the pivotal BREATHE-1 study of bosentan (a dual ERA) in patients with PAH . Compared with placebo, treatment with bosentan for 16 weeks resulted in significant improvements in Doppler-derived cardiac index (+0.4 L·min−1·m−2; p=0.007), left ventricular early diastolic filling velocity (+10.5 cm·s−1; p=0.003), left ventricular end-diastolic area (+4.2 cm2; p=0.003), left ventricular systolic eccentricity index (-0.12; p=0.047), right ventricular end-systolic area (-2.3 cm2; p=0.057), right:left ventricular diastolic areas ratio (-0.64; p=0.007), Doppler right ventricular index (-0.06; p=0.03) and percentage of patients with an improvement in pericardial effusion score (17%; p=0.05). These findings reflect the improved exercise capacity and decreased risk of clinical worsening seen in patients treated with bosentan in BREATHE-1 . In a study of epoprostenol therapy, beneficial effects on right ventricular structure and function (right ventricular dilatation, curvature of the interventricular septum and maximal tricuspid regurgitant jet velocity) compared with placebo were reported following 12 weeks of treatment, with change in 6-min walk distance (6MWD) between baseline and 12 weeks being inversely related to the change in diastolic eccentricity index and pericardial effusion size . Such improvements may contribute to the clinical improvement and prolonged survival observed with epoprostenol in other studies [58, 59]. Other evidence of improvements in right ventricular parameters has come from descriptive studies using a number of PAH-specific therapies; however, these generally include a small number of patients, and this, together with the fact that such studies evaluated different parameters (both in terms of functional parameters and measures of right ventricular size/mass), makes the assessment of results difficult. 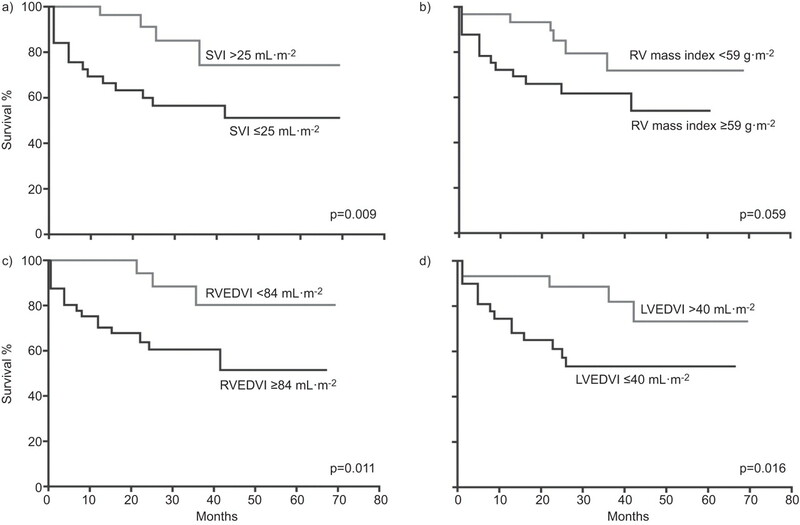 In general, right ventricular parameters such as Tei index, RVEF and right ventricular size have shown improvement following PAH-specific therapy, although results for individual parameters and different therapies vary (table 4). Reductions from baseline in right ventricular size or mass have been reported following therapy with bosentan alone , and in combination with sildenafil (PDE-5 inhibitor) [48, 56]. No positive effects on right ventricular mass were reported following long-term therapy with ambrisentan . In contrast with the short-term, randomised study mentioned above, longer term studies of epoprostenol have not shown a positive treatment effect on right ventricular size/mass [64, 69, 72], although without a comparator arm it is not possible to determine whether long-term therapy slowed down the rate of right ventricular hypertrophy or dilatation. Overall, therefore, the effects of PAH-specific therapies on right ventricular function remain to be fully investigated, although the results above show that parameters predictive of prognosis at baseline do not necessarily predict prognosis if measured as a change over time when the patient is treated medically. Importantly, although current treatments reduce right ventricular load, they do not reduce right ventricular power output or pressure significantly , and so right ventricular failure may continue to progress in a subgroup of patients, especially those with severely compromised haemodynamics at baseline. Therefore, diagnosis and active management of patients with less advanced disease (and relatively preserved right ventricular function) may improve outcome . Evidence that this may be the case comes from the EARLY study of bosentan in mildly symptomatic PAH, which showed improvements in prognostic indicators such as PVR and 6MWD, as well as delayed time to clinical worsening in the treatment group compared with placebo . With respect to the effect on the right ventricle, treating the patient when they have little clinical and haemodynamic impairment (i.e. 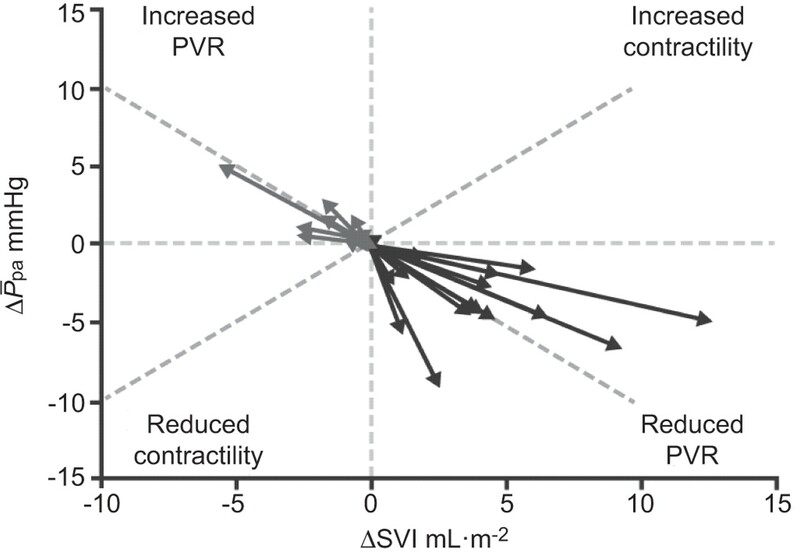 in functional class II), the magnitude of the decrease in PVR and mean Ppa achievable using current PAH-specific therapies is likely to have a more favourable effect on reducing stroke volume and the work performed by the right ventricle than in patients with more severe disease, in whom a greater reduction in PVR/mean Ppa is required to bring about a similar decrease in right ventricular workload. However, given the fact that most patients with PAH are not diagnosed until they are in functional class III or IV, additional strategies to preserve the right ventricle are required , as is the development of therapies and strategies that specifically target and support the right ventricle . The response of the right ventricle to the increase in afterload produced by the pulmonary vascular changes characteristic of PAH is the key factor in the development of symptoms and in determining survival. Despite its prognostic importance, the right ventricle has been less investigated in PAH than the pulmonary vasculature, and currently there is a lack of long-term data on the prognostic value of right ventricle parameters and on the effects of PAH-specific therapies on the right ventricle. The identification of risk factors or indicators related to the right ventricle that are relevant at baseline and during treatment, and which can be assessed regularly, and preferably noninvasively, will allow the comprehensive assessment of disease severity and response to therapy. ECHO and CMRI are being used increasingly in this respect, although, as well as undoubted benefits, both techniques currently have a number of limitations, and data from studies of the value of these techniques in prognosis and response to therapy are limited. However, with further research, validation and standardisation, and continuing improvements in technology and methodology, it is possible that ECHO and CMRI (alone and in combination) will largely supplant invasive techniques such as RHC for the evaluation of the right ventricle in patients with PAH in the future . Given the central role that right ventricular failure plays in PAH and the fact that, despite improvements in survival, right ventricular failure remains the most common cause of death in patients with PAH, greater consideration to the development of means for assessing the presence and extent of right ventricular failure, both subclinical and overt, and strategies to support the right ventricle in PAH are required. We received editorial assistance from L. Thomas (Elements Communications Ltd, Westerham, UK), supported by Actelion Pharmaceuticals Ltd (Allschwil, Switzerland). Publication of this peer-reviewed article was supported by Actelion Pharmaceuticals Ltd, Switzerland (principal sponsor, European Respiratory Review issue 122). A. Vonk Noordegraaf has received lecture fees from Actelion, Bayer, GlaxoSmithKline, Lilly and Pfizer, acted on industry advisory boards for Actelion and Bayer, and served on steering committees for Actelion, Bayer and Pfizer. N. Galiè has served as a consultant and received payment for lecture fees from Actelion Pharmaceuticals Ltd, Pfizer, GlaxoSmithKline, Eli Lilly and Bayer-Schering Pharma.
. A meta-analysis of randomized controlled trials in pulmonary arterial hypertension. Eur Heart J 2009; 30: 394–403.
. Survival in patients with idiopathic, familial, and anorexigen-associated pulmonary arterial hypertension in the modern management era. Circulation 2010; 122: 156–163.
. The right ventricle in pulmonary hypertension. Coron Artery Dis 2005; 16: 13–18.
. Predicting survival in pulmonary arterial hypertension: insights from the Registry to Evaluate Early and Long-Term Pulmonary Arterial Hypertension Disease Management (REVEAL). Circulation 2010; 122: 164–172.
. Survival in patients with primary pulmonary hypertension. Results from a national prospective registry. Ann Intern Med 1991; 115: 343–349.
. Right ventricle in pulmonary arterial hypertension: haemodynamics, structural changes, imaging, and proposal of a study protocol aimed to assess remodelling and treatment effects. Eur J Echocardiogr 2010; 11: 27–37.
. The right ventricle under pressure: cellular and molecular mechanisms of right-heart failure in pulmonary hypertension. Chest 2009; 135: 794–804.
. New insights for the diagnosis and management of right ventricular failure, from molecular imaging to targeted right ventricular therapy. Curr Opin Cardiol 2010; 25: 131–140.
. Updated clinical classification of pulmonary hypertension. J Am Coll Cardiol 2009; 54: Suppl. 1, S43–S54.
. Pulmonary arterial hypertension and chronic thromboembolic hypertension: pathophysiology. Eur Respir Rev 2010; 19: 59–63.
. Perspectives on novel therapeutic strategies for right heart failure in pulmonary arterial hypertension: lessons from the left heart. Eur Respir Rev 2010; 19: 72–82.
. p53-induced inhibition of Hif-1 causes cardiac dysfunction during pressure overload. Nature 2007; 446: 444–448.
. Increased sympathetic nerve activity in pulmonary artery hypertension. Circulation 2004; 110: 1308–1312.
. Atrial septostomy decreases sympathetic overactivity in pulmonary arterial hypertension. Chest 2007; 131: 1831–1837.
. Pharmacological impact on right ventricular remodelling in pulmonary arterial hypertension. Eur Heart J 2007; 9: H68–H74.
. Interventricular mechanical asynchrony due to right ventricular pressure overload in pulmonary hypertension plays an important role in impaired left ventricular filling. Chest 2005; 128: Suppl. 6, 628S–630S.
. Impaired left ventricular filling due to right-to-left ventricular interaction in patients with pulmonary arterial hypertension. Am J Physiol Heart Circ Physiol 2006; 290: H1528–H1533.
. Interventricular mechanical asynchrony in pulmonary arterial hypertension: left-to-right delay in peak shortening is related to right ventricular overload and left ventricular underfilling. J Am Coll Cardiol 2008; 51: 750–757.
. Prolonged right ventricular post-systolic isovolumic period in pulmonary arterial hypertension is not a reflection of diastolic dysfunction. Heart 2011; 97: 473–478.
. Complications of right heart catheterization procedures in patients with pulmonary hypertension in experienced centers. J Am Coll Cardiol 2006; 48: 2546–2552.
. Early detection of pulmonary arterial hypertension in systemic sclerosis: a French nationwide prospective multicenter study. Arthritis Rheum 2005; 52: 3792–3800.
. The echocardiographic assessment of the right ventricle: what to do in 2010? Eur J Echocardiogr 2010; 11: 81–96.
. Survival of Chinese patients with pulmonary arterial hypertension in the modern management era. Chest 2011; 140: 301–309.
. Echocardiographic predictors of adverse outcomes in primary pulmonary hypertension. J Am Coll Cardiol 2002; 39: 1214–1219.
. Effects of long-term infusion of prostacyclin (epoprostenol) on echocardiographic measures of right ventricular structure and function in primary pulmonary hypertension. Primary Pulmonary Hypertension Study Group. Circulation 1997; 95: 1479–1486.
. Right atrial size and tricuspid regurgitation severity predict mortality or transplantation in primary pulmonary hypertension. J Am Soc Echocardiogr 2002; 15: 1160–1164.
. Clinical and prognostic relevance of echocardiographic evaluation of right ventricular geometry in patients with idiopathic pulmonary arterial hypertension. Am J Cardiol 2011; 107: 628–632.
. Prognostic relevance of the echocardiographic assessment of right ventricular function in patients with idiopathic pulmonary arterial hypertension. Int J Cardiol 2010; 140: 272–278.
. Tricuspid annular displacement predicts survival in pulmonary hypertension. Am J Respir Crit Care Med 2006; 174: 1034–1041.
. Value of a Doppler-derived index combining systolic and diastolic time intervals in predicting outcome in primary pulmonary hypertension. Am J Cardiol 1998; 81: 1157–1161.
. Retrospective study of pulmonary hypertensive patients: is right ventricular myocardial performance index a vital prognostic factor? Hellenic J Cardiol 2007; 48: 152–160.
. Right ventricular strain for prediction of survival in pulmonary arterial hypertension. Chest 2011; 139: 1299–1309.
. Right ventricular dyssynchrony in patients with pulmonary hypertension is associated with disease severity and functional class. Cardiovasc Ultrasound 2005; 3: 23.
. Usefulness of the right ventricular systolic to diastolic duration ratio to predict functional capacity and survival in children with pulmonary arterial hypertension. Am J Cardiol 2010; 106: 430–436.
. 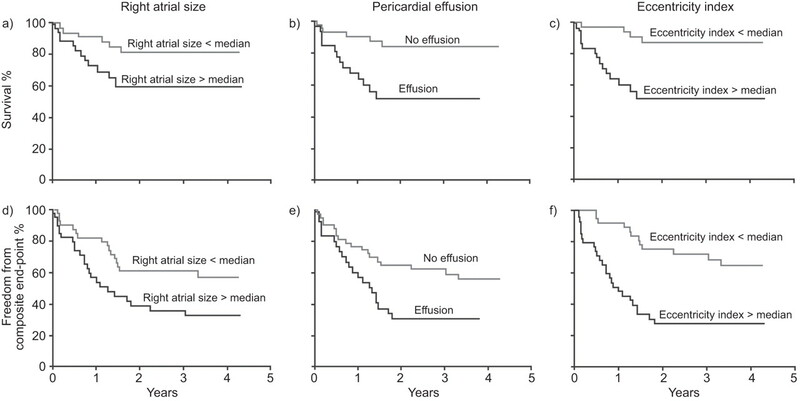 Frequency and prognostic significance of pericardial effusion in primary pulmonary hypertension. PPH Study Group. Primary pulmonary hypertension. Am J Cardiol 1999; 84: 481–484.
. The relation between quantitative right ventricular ejection fraction and indices of tricuspid annular motion and myocardial performance. J Am Soc Echocardiogr 2004; 17: 443–447.
. Severe tricuspid regurgitation shows significant impact in the relationship among peak systolic tricuspid annular velocity, tricuspid annular plane systolic excursion, and right ventricular ejection fraction. J Am Soc Echocardiogr 2006; 19: 902–910.
. Right ventricular systolic function is not the sole determinant of tricuspid annular motion. Am J Cardiol 2006; 98: 973–977.
. Doppler echocardiographic index for assessment of global right ventricular function. J Am Soc Echocardiogr 1996; 9: 838–847.
. Evaluation of global and regional right ventricular systolic function in patients with pulmonary hypertension using a novel speckle tracking method. Am J Cardiol 2006; 98: 699–704.
. Usefulness of three-dimensional echocardiography in assessing right ventricular function in patients with primary pulmonary hypertension. Hypertens Res 2009; 32: 419–422.
. Role of cardiac magnetic resonance imaging in the management of patients with pulmonary arterial hypertension. J Am Coll Cardiol 2008; 52: 1683–1692.
. Pulmonary arterial hypertension: the key role of echocardiography. Chest 2005; 127: 1836–1843. Davar J. How should we assess right ventricular function in 2008?Eur Heart J 2007; 9: H22–H28.
. Ventricular mass index correlates with pulmonary artery pressure and predicts survival in suspected systemic sclerosis-associated pulmonary arterial hypertension. Rheumatology 2009; 48: 1137–1142.
. Cardiovascular magnetic resonance measured right ventricular mass influences prognosis in pulmonary arterial hypertension. Eur Heart J 2010; 31: 8.
. Prognostic value of right ventricular mass, volume, and function in idiopathic pulmonary arterial hypertension. Eur Heart J 2007; 28: 1250–1257.
. LGE in pulmonary hypertension predicts clinical events. J Cardiovasc Magn Resonance 2011; 13: Suppl. 1, P297.
. Cardiac magnetic resonance imaging for the assessment of the heart and pulmonary circulation in pulmonary hypertension. Eur Respir J 2009; 33: 1454–1466.
. The emerging role of magnetic resonance imaging in the diagnosis and management of pulmonary hypertension. Respiration 2008; 76: 458–470.
. Echocardiographic characterization of the improvement in right ventricular function in patients with severe pulmonary hypertension after single-lung transplantation. J Am Coll Cardiol 1993; 22: 1170–1174.
. Reverse cardiac remodelling in patients with primary pulmonary hypertension after isolated lung transplantation. Eur J Cardiothorac Surg 2004; 26: 776–781.
. Reverse right ventricular remodeling after pulmonary endarterectomy in patients with chronic thromboembolic pulmonary hypertension: utility of magnetic resonance imaging to demonstrate restoration of the right ventricle. J Thorac Cardiovasc Surg 2007; 133: 58–64.
. Effects of the oral endothelin-receptor antagonist bosentan on echocardiographic and Doppler measures in patients with pulmonary arterial hypertension. J Am Coll Cardiol 2003; 41: 1380–1386.
. Sildenafil versus Endothelin Receptor Antagonist for Pulmonary Hypertension (SERAPH) study. Am J Respir Crit Care Med 2005; 171: 1292–1297.
. Bosentan therapy for pulmonary arterial hypertension. N Engl J Med 2002; 346: 896–903.
. Survival in primary pulmonary hypertension with long-term continuous intravenous prostacyclin. Ann Intern Med 1994; 121: 409–415.
. A comparison of continuous intravenous epoprostenol (prostacyclin) with conventional therapy for primary pulmonary hypertension. The Primary Pulmonary Hypertension Study Group. N Engl J Med 1996; 334: 296–302.
. Survival after the initiation of combination therapy in patients with pulmonary arterial hypertension: an Australian collaborative report. Intern Med J 2011; 41: 235–244.
. Beneficial and adverse effects of bosentan treatment in Korean patients with pulmonary artery hypertension. Korean Circ J 2009; 39: 105–110.
. Bosentan for the treatment of human immunodeficiency virus-associated pulmonary arterial hypertension. Am J Respir Crit Care Med 2004; 170: 1212–1217.
. Duration of right ventricular contraction predicts the efficacy of bosentan treatment in patients with pulmonary hypertension. Eur J Echocardiogr 2009; 10: 433–438.
. Epoprostenol treatment in children with severe pulmonary hypertension. Heart 2007; 93: 739–743.
. Efficacy of sildenafil as a rescue therapy for patients with severe pulmonary arterial hypertension and given long-term treatment with prostanoids: 2-year experience. J Heart Lung Transplant 2006; 25: 1353–1357.
. Use of myocardial performance index in pediatric patients with idiopathic pulmonary arterial hypertension. J Am Soc Echocardiogr 2006; 19: 21–27.
. Bosentan increases myocardial perfusion and function in systemic sclerosis: a magnetic resonance imaging and tissue-Doppler echography study. J Rheumatol 2006; 33: 2464–2469.
. Bosentan improves exercise tolerance and Tei index in patients with pulmonary hypertension and prostanoid therapy. Chest 2005; 128: 709–713.
. Effect of chronic infusion of epoprostenol on echocardiographic right ventricular myocardial performance index and its relation to clinical outcome in patients with primary pulmonary hypertension. Am J Cardiol 2001; 88: 1060–1063.
. Changes in right ventricular structure and function assessed using cardiac magnetic resonance imaging in bosentan-treated patients with pulmonary arterial hypertension. Am J Cardiol 2008; 101: 1669–1672.
. Right ventricular reverse remodelling after sildenafil in pulmonary arterial hypertension. Heart 2006; 92: 1860–1861.
. Effects of epoprostenol on right ventricular hypertrophy and dilatation in pulmonary hypertension. Chest 2004; 125: 572–579.
. Serial changes in TAPSE correlate with functional assessment and clinical events in patients with PAH. Am J Respir Crit Care Med 2009; 179: A4882.
. Correlation between right ventricular indices and clinical improvement in epoprostenol treated pulmonary hypertension patients. Echocardiography 2005; 22: 374–379.
. Long-term outcomes with ambrisentan monotherapy in pulmonary arterial hypertension. J Card Fail 2010; 16: 121–127.
. Long-term treatment with oral sildenafil is safe and improves functional capacity and hemodynamics in patients with pulmonary arterial hypertension. Circulation 2003; 108: 2066–2069.
. Treatment of patients with mildly symptomatic pulmonary arterial hypertension with bosentan (EARLY study): a double-blind, randomised controlled trial. Lancet 2008; 371: 2093–2100.
. Right ventricular failure: a novel era of targeted therapy. Curr Heart Fail Rep 2010; 7: 202–211.